When Amazon released the Kindle Oasis back in the spring of 2016, we said it was the best e-reader ever made. But that doesn’t mean it was perfect, and in the year and half since it came out, it’s become clear there was room for improvement. With a starting price of $290, the old Oasis was a bit pricey, it had a blocky (and now outdated) design and it was missing features like the adaptive backlighting found on the even older Kindle Voyage. And despite having a name that immediately conjures up visions of pools and fountains, the previous Oasis didn’t have any sort of water-resistance either. But now, Amazon is giving it another go with the simply (and annoyingly) named New Kindle Oasis, which looks to address all those shortcomings while also adding a number of new improvements too. The new Oasis is on the left, the old Oasis is on the right. Starting at $250, the new Oasis packs a larger 7-inch display (versus the 6-inch screen on the old Oasis) that Amazon claims can show up to 30 percent more text while retaining the same 300 PPI pixel density as the old model. Amazon has also increased the number of LED backlights from 10 to 12, so now the screen should be brighter than before, while also being able to dim itself automatically when needed thanks to the return of the ambient light sensor. But more importantly, the new Oasis features IPX8 water-resistance which is good down to 5 feet of water for 30 minutes, which Amazon claims should hold true in both salt and freshwater, unlike most water-resistant devices. The Oasis still has that reversible asymmetrical design that’s good for both lefties and righties. Even though the screen is bigger, the new Oasis feels noticeably slimmer. The folding covers double as a kickstand too. Aside from the two page turn buttons, there’s one more physical button on the corner for power. The back is all aluminum. Like previous Kindles, the new Oasis can still get a bit greasy looking. The little headphone icon in the top right let you know you have the audio book version too. Audio book controls are simple and straightforward. It looks like there should be plenty of room for additional ports. The folding covers attach magnetically to the back of the device. Official covers will be available in fabric or leather versions across multiple colors. The new Oasis still has a matte display, which helps cut down on glare. Amazon claims the new Oasis can fit 30 percent more text than the old model. Then there’s the new Oasis’ design, which still has handy programmable page turn keys, a sleeker body, and a single on-board battery (instead of the one on the old Oasis that was split between its folding cover and the device itself) that should last up to six weeks on a charge. Good luck testing that. The new Oasis also comes with 8GB of storage standard, which is twice as much as you previously got, and that makes a lot of sense considering the new Oasis will also be the first Kindle to support Audible audio books too. 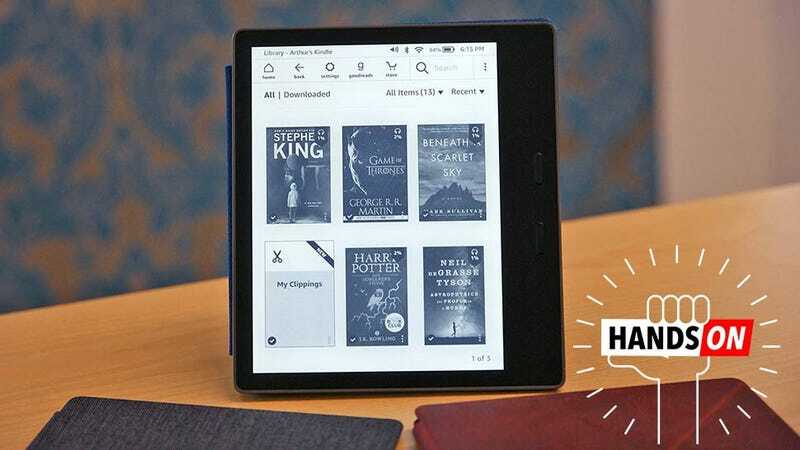 You still need to buy ebooks and audio books separately (though you can get a discount if you buy both versions), but now, you should be able to access all your books on a single device. Amazon has even updated its WhisperSync system to work with both types of book files, so that no matter what device you were using or how you were reading or listening, you’ll be able to pick up right right where you left off last. However, based on my brief time holding the new Oasis, there’s still a few design choices that rub me the wrong way. Even though Amazon has included support for audiobooks, the Oasis doesn’t have built-in speakers or a headphone jack. That means the only way to actually listen to your books is to hook up some Bluetooth headphones, which is something that could get tedious if you have to share your headphones between the Kindle and another device like a tablet or smartphone. Amazon claims there’s no room for a standard 3.5mm audio jack, and while I’m no electrical engineer, judging by the fact that the only port on the device is a outdated micro USB jack, I have to at least wonder. What’s more annoying is that if Amazon had gone with USB-C instead of micro USB, it could have potentially killed two birds with one stone, since USB-C can be used for both charging and audio. The new Oasis’ magnetic folding covers will be available separately for between $45 and $60 depending on whether you opt for the less expensive fabric versions or the pricier leather ones. Aside from the silliness with the ports, other small improvements include faster page turn animations, more settings for font sizes and boldness, a left align option and an inverted color scheme that’ll put white text on a black background. The new Oasis is available for pre-order today starting, with shipments slated to go out on October 31st. Prices start at $250 for the base model with 8GB of storage, $279 for the 32GB model and $350 for version with 32GB of storage and 4G LTE connectivity.